In March 2014 I reviewed for MusicWeb International Seen and Heard a concert in Symphony Hall, Birmingham by Michael Tilson Thomas and the San Francisco Symphony. This was the opening concert in a European tour and Absolute Jest was on the programme. I enjoyed that performance very much so I was delighted that this SACD offers the chance to listen to it again in detail and at greater leisure. The piece was written for the centenary of the San Francisco Symphony which fell in 2011. Subsequently Adams drastically revised the opening section of the score and it’s this 2013 definitive version that is played here. In a booklet note Adams describes Absolute Jest as “a colossal twenty-five minute scherzo in which I take fragments of Beethoven’s music and subject them to my own peculiar development techniques.” The Beethoven works that Adams has raided are mostly the Sting Quartets Opp, 131 and 135 as well as the Grosse Fugue. He also throws in a number of references to Beethoven’s symphonies, notably the first movement of the Seventh Symphony and the scherzo of the Ninth. Since I’m less familiar with the string quartets than with the symphonies it’s the symphonic allusions that I registered most strongly. Absolute Jest is scored for string quartet and a large symphony orchestra. On this recording, as in Birmingham, it’s the St Lawrence String Quartet who do the honours. In Birmingham they were discreetly amplified – a very necessary step to prevent their sound being drowned by the orchestra. No such problems arise on disc, of course, and the quartet is nicely in the foreground, which is right and proper. The notes accompanying this disc make a very interesting point, which was not covered, so far as I recall, in the Birmingham concert programme note. Larry Rothe, the author of an excellent history of the San Francisco Symphony, points out that the word “jest” derives from the Latin word gesta, meaning a noble deed. 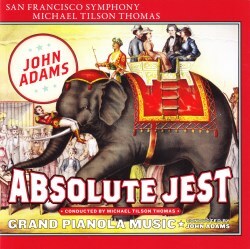 He says: “A jest is not therefore by definition a thigh-slapper, nor is Absolute Jest a comedy.” That’s a most interesting insight and it explains why Michael Tilson Thomas has described the score as one of the composer’s most profound. Nonetheless, having reacquainted myself with the piece I think I’d stand by the verdict that I reached last year: “what struck me on a first hearing – and this is not to suggest a lack of profundity – was how entertaining and witty the score was: it is well entitled ‘Jest’. Much of the music is high-spirited and full of vitality and at times it is clearly rhythmically intricate, as one could tell from MTT’s beat.” However, I now better appreciate the serious – or should I say thoughtful – side of the piece. In the extended opening section there is constant energy and forward momentum. A good deal is made of the 6/8 rhythm that one hears in the first movement Allegro of Beethoven’s Seventh. Though rhythmic propulsion is the first feature to strike the listener I have now been able to discern more lyricism and also the sheer intricacy of the writing than was apparent to me in Birmingham on first hearing the music. The piece is in six sections and it’s not until we reach section 4, Meno mosso, some fifteen minutes after the start, that the pace eases. This section begins with quiet musing from the quartet against a subdued, shimmering orchestral background. Are we to take this as the scherzo’s trio, I wonder? The section is a welcome and necessary chance to catch one’s breath after all the preceding activity. However, the respite doesn’t last long; as soon as 2:10 into the section the pace starts to pick up again and gradually the music accelerates excitingly into the Vivacissimo section. By now I had almost forgotten that the piece is inspired by Beethovenian fragments but small thematic cells continue to pop up in the texture. In the last section, Prestissimo, the string quartet, in Adams’ words, is “furiously riffing over the opening chord progression of the Waldstein Sonata.” The music is breathless and joyous but Adams has one more surprise up his sleeve. You might expect a fast and furious ending; instead Adams cuts off the quartet and full orchestra and the last word – a quiet one – is provided by a deliberately mis-tuned piano and harp. After listening to the Birmingham performance I wrote this: “What struck me forcefully as I listened was how well matched, how complementary, are Adams’ and Beethoven’s music in the sense that both make such a virtue of the use of rhythm to impel their music. It seems so obvious that I don’t know why I’ve not previously made the connection but the juxtaposition of the two composers in Absolute Jest brought it home very strongly.” I would now add to that verdict that the work is an exciting and very superior entertainment. The performance by the often hyper-active St Lawrence String Quartet and by Tilson Thomas and his fine orchestra is razor-sharp and, I would suggest, definitive. This is an important Adams work and a major addition to his extensive discography. Grand Pianola Music is a much earlier work; in fact it is a score that owes a lot to his minimalist beginnings. It’s a piece that has attracted scorn in some quarters – unfairly, I believe – not least on account of the unashamedly corny Big Tune in the last of its three sections. It’s much more modestly scored; double woodwind and brass, tuba, percussion, including two bass drums, two grand pianos and three female singers. These singers make a crucial contribution to the textures, singing wordlessly; Adams calls them “sirens”. The members of Synergy Vocals make a wonderful contribution to this performance. This is not the first time that the composer has recorded the piece; he set down a studio recording in 1993 with the London Sinfonietta (Electra Nonesuch 7559 79219-2). Writing in the booklet that accompanies that disc Adams says that he wrote Grand Pianola Music “not to épater les bourgeoisie, but rather for the sheer pleasure of hearing certain musical “signals” – one could even call them clichés – piled up against one another.” I don’t believe the work is profound but it is intricate and intriguing; it’s also a lot of fun. Initially the third movement, in Adams’ words “rocks back and forth between tonic and dominant” until (at 1:30) it arrives grandly and unambiguously in the major key, paving the way for That Tune (2:36). This tune is deliberately corny, as is Adams’ treatment of it, but any composer who can entitle the last movement of a Chamber Symphony ‘Roadrunner’ has to have a keen sense of irony and humour. But forget about the corny nature of the tune; the construction of the music is fascinating and often intricate. I really enjoyed this performance – and what luxury casting to have Marc-André Hamelin as one of the pianists. I said Adams had recorded this piece before. That 1993 rendition benefits from the customary virtuosity of the London Sinfonietta, who are by no means shaded by the excellent San Francisco players. The recording itself still sounds well but it’s not as vivid as the new SFS Media version and on the old recording the piano sound is a bit harsh and tinkling at the treble end. The SFS Media recording of both pieces is very truthful; the sound has great impact. Though both performances are live the audience is silent; there’s applause only after Grand Pianola Music. The playing time is rather ungenerous but the value lies in the music and the performances. This is a cracking disc and all Adams devotees will want it.